Beautiful blue eyes are sung about in verse and prose by musicians, and artists praise them as well. 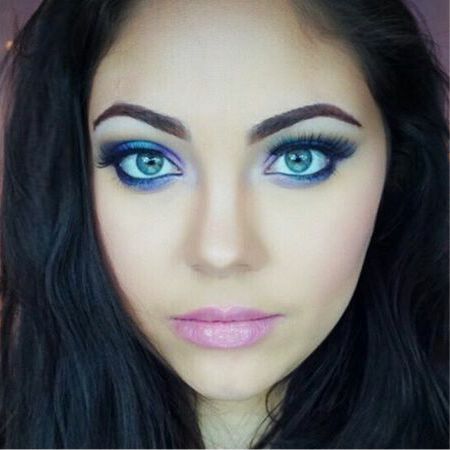 Here we will discuss makeup techniques for blue eyes. How should it look? What suits blue eyes and what doesn’t? How do you emphasize the color, making it more expressive and vivid? First, you should begin with a light primer. The primer should be white, salmon, pearl, or light beige. To enhance the effect, you can carefully lighten the space directly under the eyebrows. Next, we apply foundation to the central part of the upper eyelid. Makeup for blue eyes is easy and weightless, made up of delicate color transitions and bright colors. The darkest eyeshadow is applied to the outer corners of the eye as it will help make the eyes appear bigger, more expressive, and brighter. Avoid using very dark colors. The most you can afford to use is an eyeshadow that is one or two shades darker than your natural eye color. The most common mistake is using the color blue in your makeup. If applied incorrectly, blue eyes decorated in blue eyeshadows can look blank and even come to resemble bruises. As an additional side note, green and pink shades of shadow should not be used. The best colors for blue eyes are gray, brown, dark chocolate, violet, purple, and gold. It should be noted that gray is versatile and suitable for almost all eye types. As for the color of the eyeliner, everything is individual and depends on your personal preferences. Some like black eyeliner only, but sometimes it’s ok to try a new color, such as purple or brown. Brown goes really well with blue eyes because it’s soft, unobtrusive, and at the same time, contrasting as well. This is an excellent option not only for daytime makeup but for evening makeup as well. For interesting results, you can add some bold, contrasting colors for evening makeup, such as purple and orange. Like the article «Eye Makeup for Blue Eyes»? Share it with friends!